The Stirling Club, a 78,000-square-foot club on 3.2 acres at Turnberry Place on Paradise Road, has been listed for sale by local commercial real estate brokerage CBRE Las Vegas. A high-end private club shuttered in the recession is in the market for a new life. It’s the latest twist in the club’s tortuous recent history. 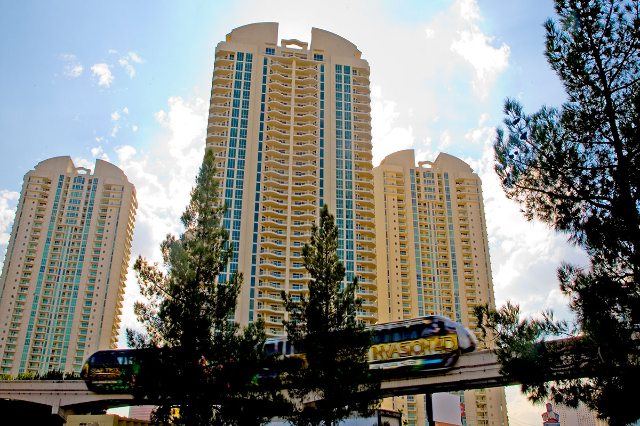 Built in 2001, the club had an entertainment venue, workout center, spa and Charlie Palmer-run restaurant for residents of Turnberry’s 772 high-rise condominium units. But by May 2012, owner Turnberry Associates could no longer afford to keep the club open, despite $400 in monthly membership fees from each unit. Nor could it find a buyer to take over operations. So it closed the venue. The Stirling Club was just one in a parade of tough local losses for Florida-based Turnberry Associates. The developer was also forced into bankruptcy with its halted, $3 billion Fontainebleau project on the Strip, and it defaulted on the $750 million Town Square retail and office center on Las Vegas Boulevard South. It lost Turnberry Towers West at Karen Avenue and Paradise to foreclosure, as well. All three properties found new owners. Investor Carl Icahn owns the still-stalled Fontainebleau. Ohio retail developer Forest City Enterprises managed and stabilized Town Square. And Los Angeles developer CIM bought Turnberry Towers West, where it continues to market units. For the Stirling Club, CBRE Las Vegas didn’t give a list price, but a group of Silicon Valley entrepreneurs bought the club in an online auction for about $10 million in November 2013. The buyers invested additional money to keep up the pool and the building’s mechanical systems, said CBRE Las Vegas broker Michael Parks. “They’ve continued to spend significant resources to maintain the facility,” he said. Parks said he expects the building to sell for more than $10 million but less than half of its original construction price of $44 million. But the club never reopened. The owners discussed relaunching with several operators, but decided to sell because “their core business is in the tech field, and they felt spending time trying to operate the club would take time away from how they earn their living,” Parks said. Parks said the club could find second life not just as a private club, but as a potential office. A buyer might purchase a unit at Turnberry Place, where condominiums are listed for as much as $6 million, and snap up the Stirling Club building as a headquarters for his professional services firm. CBRE Las Vegas is also marketing the property as a potential private residence, or as a rehabilitation center or cosmetic-surgery building. “It’s a great facility that lends itself to alternative uses. There are a number of potential end uses for it because of its high-quality finishes,” Parks said. Contact Jennifer Robison at jrobison@reviewjournal.com. Follow @_JRobison on Twitter.